The usual procedure for one of these reviews is for a manufacturer or distributor to contact TNT and offer something that they would like reviewed. One of we scribes then agrees to do the review, and the item is duly sent to us at home. But when I was offered some speakers that were physically too large for my room (well too large to hear them at their best) the manufacturer invited me to hear them at his home. 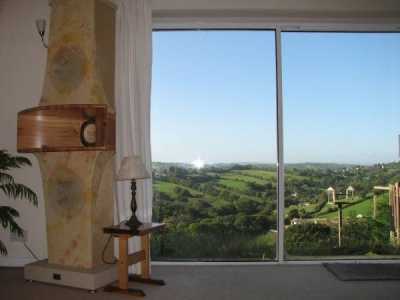 As that home was in the neighbouring county of Devon, about an hour's drive away, I accepted the invitation. 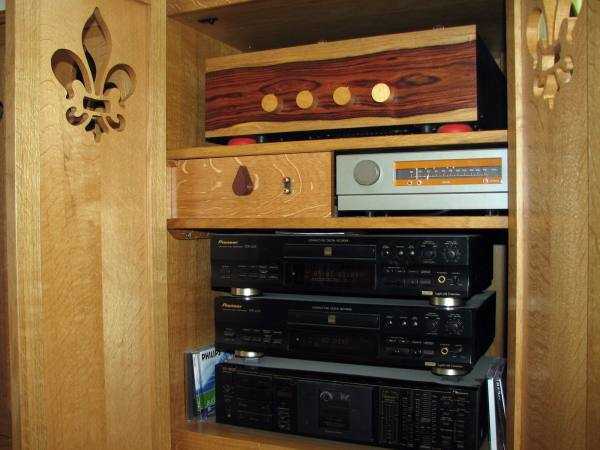 Like most of us, John Richardson of Prophecy Audio has been on a long quest for a hi-fi system that really satisfied him. Sensibly his goal has been total satisfaction rather than 'perfection' and perhaps more of us should have the same ambition. He likes his music loud, and I do mean loud! He likes scale, ie 'life-sized', he likes it involving, and he likes it to communicate. After the usual journey through many different types of speaker, John decided that his holy grail lay with some type of front loaded horn. Having decided that Lowther drivers were the way forward, he then designed a suitable front-loading horn, but was still aware that for the sound levels he craved, the Lowther would need some serious help with the bass. His solution was to add bass-reflex cabinets using SEAS 8 inch drivers. When I say cabinets, I do mean plural, and not just one per channel. The Prophecy uses two per channel with one beneath the horn, and another mirrored above it. 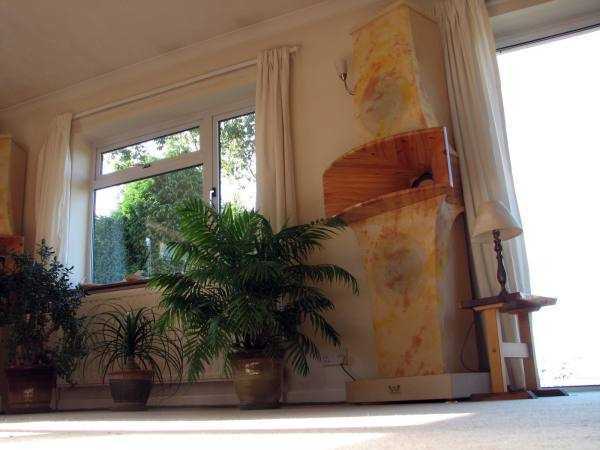 The result is what some may consider a monster of a speaker standing around two metres high. Marchand 24db/octave passive filters are supplied to roll off the bass in the bass-reflex cabinets but the Lowther EX2's are left to run full-range. If it is intended to play the Prophecys at very high levels, it is recommended that a filter is used in front of the EX2 to relieve it of frequencies below 100-150 hz. So, a suitable filter can be supplied by Prophecy Audio as an optional extra. It may have been providence that I had been asked to go and audition the Prophecys because my own speakers are on the large side too, and I didn't find the size of the Prophecys too much of a shock. Of course, there will be many who will find the size overwhelming, and those without the most tolerant of living-partners (or their own dedicated listening room), may as well forget about these speakers straight way. 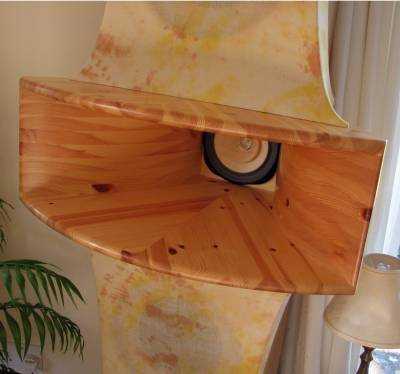 As horn loudspeakers go, the Prophecy is not necessarily that big, and considerable thought has gone into giving it some WAF. 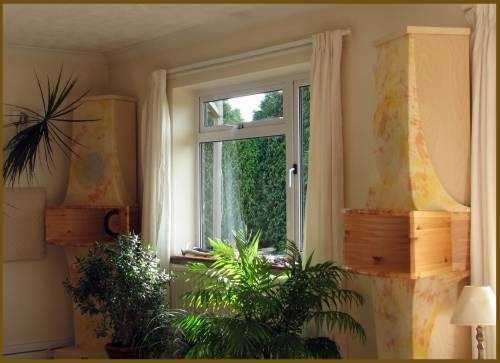 Instead of the more usual black, or all-wood finish, the large bass-reflex cabinets are partly clad in an attractive open-weave cloth that has been tie-dyed to produce a light-coloured finish that blended in well with the natural wood finish of the speakers, and the decor of my host's listening room. The Prophecys are being offered with some degree of customisation, and the cloth finish will be available to the customer's specification. The standard of finish is very high and you can get an idea of the quality of workmanship by looking at the cabinet that John Richardson built to house his own system. The horn is fabricated from pine with no small amount of time and craftsmanship involved to achieve the finished result. Once finished, the wooden horns are then treated to a number of coats of lacquer. John even bought a drying kiln as it was not possible to buy pine with a low enough moisture content. The Lowther EX2 sits inside the horn but is open to the rear, providing some of the advantages of open-baffle construction. More importantly, any problems caused by a rear horn are eliminated. The plinths are made from solid limestone although granite may be used for later versions if the 'right' colour can be sourced. All in all, I felt that these speakers were about as domestically friendly as an item of that size can be, but how did they sound? I had taken down a handful of CD's (having retrieved them from storage where they have been since I bought a Squeezebox) and was invited to choose something to start the audition. I went for Stacey Kent ('The Tender Trap') and sat back to listen. My very first impression was that the bass was not quite as tight as with my own system. This was probably being hyper-critical as my own system has open-baffle bass and the services of a Behringer DEQ2496 to keep things in order (and it doesn't play anywhere near as loud!). It may also be the actual bass-reflex design that is known to shift phase, and therefore reduce bass accuracy. But, to be honest, after a few tracks I didn't notice this issue. The amount of bass is plentiful, it's tuneful, and it goes loud all the way down to somewhere around the claimed 20 hz at my estimation. And it certainly isn't 'boomy' at any sound level. The mid-range was glorious, revealing the lovely voice that Ms Kent has in all its glory, and giving her real presence. The sound-stage was wide, and the speakers simply disappeared (acoustically). There wasn't the depth of sound-stage that I get with my open-baffles, possibly because the speakers are situated right back against the walls. But oh, the size and scale! Performers really were life-sized, as were the instruments. The imagining wasn't pin-point sharp but it was good enough to provide a clear idea of where everything was within the sound stage. And being so wide, there was heaps of space/air between individual performers and instruments. Sitting in front of such a powerful sounding system, it's rather like being in a high-powered car and wanting to put your foot down hard and see what it will do. So rock replaced jazz, off came Stacey Kent, to be replaced by Joan Osborne ('Relish'). This is a powerful sounding album and even more so through the Prophecys! I was quickly noticing that just about any genre of music played through the Prophecys sounded 'right'. The vocals while presented really clearly were neither too far forward, nor recessed into the rest of mix. Drum sounds were particularly well portrayed, the sounds being large and fast with a great attack. This prompted me to put on the 'Dafos' album and play the track 'Subterranean Caves of Kronos', one of the best tests of a system's ability to play bass and percussion. The Prophecys not only passed the test but left me wondering if I had ever heard that track played so convincingly before. Next into the CDP was the Roger Water's album 'Amused to Death'. While making this album sound very good, the Prophecys didn't produce the holographic presentation of the Q-sound effects that I experience in my own system. I suspect again that may have been down to speaker placement but it is worth mentioning as this is meant to be a critical assessment of an expensive speaker. The 'Gracelands' CD by Paul Simon confirmed what musical speakers the Prophecy are, and what great speed and timing they possess. The bass-lines on the album were also very tuneful and addictive. In fact, I would use the word 'addictive' to describe the overall experience when listening to the Prophecys. Almost in the blink of an eye, a whole morning passed by with CD's sliding in and out of the CDP (and the occasional LP played too). Al Stewart, Eva Cassidy, Van Morrison and Diana Krall, from the CD's that I had taken down, and more from my host, including Afro Celt Sound System, whose percussion-lead sound comes through very well on the Prophecys. Classical music was simply heavenly, again with an amazing sense of scale. Anything that went on sounded good. Toward the end of our session, I chose to put on the last track of the Dadawa CD 'Sister Drum'. This track features the soft vocals of Dadawa placed against a gargantuan back-drop of Tibetan horns, gongs, and chanting. The power of this track is impressive on most decent hi-fi systems. On the Prophecys it is simply breathtakingly awesome! I can't imagine anybody hearing it and not being totally amazed! John Richardson countered that selection by putting on a live performance by Joe Bonamassa ('Walk in my shadow') at such a level that I would not have been happy to listen for more than a single track. It really was like being at a live concert and sitting close to the PA stack! Of course, with powerful amplification, you can turn many systems up to similar levels but the trick is in being able to do so without stressing the speakers, and without creating distortion, and without wanting to run from the room. The Prophecys appear to play at sound levels that would easily damage hearing but without sounding distorted. Everything is portrayed as it would be at much lower sound levels, even when the music content is complex. Forget the infamous 'Lowther shout', it wasn't in evidence at all. The drivers that I was listening too were more than adequately run in, and John Richardson states that all production models of the Prophecy will use drivers that have at least a thousand hours of running in before the customer takes possession of them. So there is no listening fatigue at all and I could easily have listened for another few hours. I should add that you don't have to turn up the volume to enjoy the Prophecys. Like all very efficient speakers they will perform well at much lower sound levels as well. But you will need to be careful with that volume control. Even with the fairly low-gain system that I heard them with, a very small tweak of the volume knob could result in a sound level that could be much louder than desired! This article was originally intended more as an introduction to a new speaker on the market, rather than a full review. I didn't expect to form an opinion one way or the other having listened to the Prophecys for only a day, and then in somebody else's listening room, with their system. But the Prophecys make a fairly immediate impact on the listener, and then go on to make you fall in love with what they achieve. Yes, the bass wasn't as tight as I thought it could have been although others who will hear them may think that I am being over-critical on that aspect. And it is so tuneful, so fast, so 'loud' that you quickly forget about that small lack of 'tightness'. This of course could be down to the amplification (valves), the port tuning in the reflex cabinets, or even the room/speaker placement. The sound-stage wasn't as holographic as my own open-baffles, possibly due to speaker placement that admittedly is more 'constrained' with such a physically large speaker. That said every speaker is a compromise. If it wasn't we would surely have the near-perfect speaker in all our homes by now. John Richardson told me that he primarily wants to listen to, and enjoy, his large collection of music. He isn't a hi-fi 'addict' who wants to keep toiling away for years in pursuit of that illusive 'perfect system'. He is happy that the Prophecys now fulfill his expectations, and listening to them, I have to say that I agree: the Prophecys are so good, so enjoyable, that any compromises easily get forgotten as soon as the music starts to play. The Prophecys made me think less of hi-fi and more of the music. The ultimate question in any review has to be "would I like this item in my own system?" Well I love the holographic sound-stage of my own speakers, and pretty much everything else about them. And in my current home, I couldn't accommodate the Prophecys in my listening room, much less play them as loud as I would love to without alienating all the neighbours in my street. But, if I had a larger listening room, and lived in a detached property with the nearest neighbour several hundred metres away, then yes, I would certainly lust after the Prophecys based on what I heard during my audition. It's not just that they can play so loud, it's that scale, where everything really is life-size. It makes the presentation sound so life-like that the listener is almost instantly absorbed in the performance as of course they should be. John's system has been lovingly and knowledgeably put together and certainly works well with the Prophecys but I am confident that the bass/sound-stage issues could be improved with different equipment/room/placement. 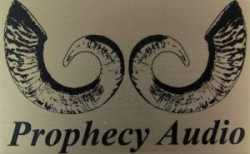 Even if they couldn't, I would still be happy to own and use the Prophecys if they sounded like they did during my visit. The Prophecys aren't cheap in any way. The purchaser is paying for a hand-crafted item that is not mass-produced in China, and the price reflects that. And it requires a lot of man-hours to produce something as complex, and as large as the Prophecys. The purchase price does include free delivery and set-up in your own home if you live within a 200 mile radius of Prophecy Audio (near Exeter). And for customers further afield, this personal delivery service is negotiable depending on distance. Add to that service, and a level of (finish) customisation, and the price of the Prophecys compares quite favourably to speakers of a similar specification. Potential purchasers of such an extreme speaker, and at the price, will almost certainly want to audition the Prophecys before they part with their money. With John happy to demo them in his lovely home, I can thoroughly recommend a trip to what is a beautiful part of the UK, for a listening experience that certainly won't leave you in any doubt about whether the Prophecy is for you. Thanks to John and his family for their hospitality, and apologies to the family in the house down the hill for any disturbance to your weekend peace and quiet. Voyd turntable with modified Rega RB250 arm, and Audio note IQ cartridge. Pioneer PDR609 for CD transport. Audio Note Quest silver power amps for the horns, using JJ 300B valves. Quad 606 for the bass units. Interconnects are Audio Note Lexus, and custom made. Loudspeaker cables are also custom made.